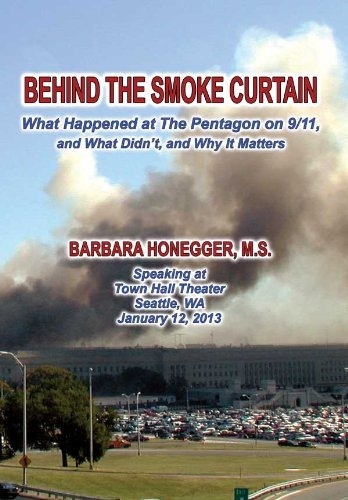 Behind the Smoke Curtain with former DOD analyst Barbara Honegger, M.S. Barbara Honegger, M.S. served under President Reagan as a high level domestic policy analyst, then moved to the Dept. of Justice. After leaving Washington, she became the Senior Military Affairs Journalist for the Naval Postgraduate School. She asserts that the attack on the Pentagon on 9/11 was an inside job, which "has been proven." Described as "the definitive work" on the Pentagon self-attack on 9/11, the following 3-hour presentation was made in Seattle at the Town Hall on January 12, 2013, on what happened and what didn't happen at the Pentagon on September 11, 2001.